When a mysterious package arrives just in time for Diwali, three curious monkeys can hardly contain their excitement! Sparklers? Bangles? Diyas? Whatever could it be? Discover the most special gift of all… in this tale of tradition, curiosity, and fun! Order your author signed copy here! 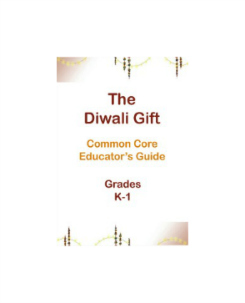 SHIPS BEFORE DIWALI Download FREE Diwali Lesson Plan for Schools. Easy cheatsheet for parents. Loved this book! 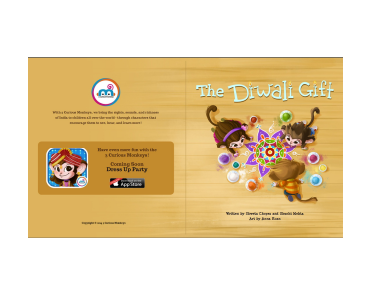 Unlike a lot of illustrated children’s books about Indian festivities, this one has a very bright, vibrant and new-age modern feel to it. The characters are very cute and the story keeps kids guessing to the end. 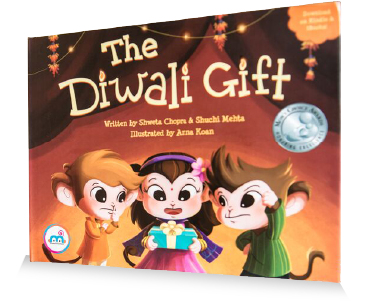 Perfect as Diwali gifts for kids aged 2-8, and great for the older siblings to read with the little ones. It does have reference to the Hindu Gods Laxmi and Ganesh at the very end, for anyone wondering about that, but the rest revolves around the festivities of Diwali that are pretty much celebrated by all Indians regardless of their religion. My kids (2 and 4) loved the book! Since we received it, my daughter asks me to read it to her every night!